truffles | Some More Please! A delicious food blog that will keep your tastebuds coming back for more. I love Christmas time! Not for any religious reasons, but the fact that it’s so wonderfully festive and colourful and people come together and all the nifty cute projects people get up to are so wonderful. I went to an early Christmas dinner and I decided to bring a fancy dessert. I wanted to do something spectacular and not just a cheesecake or a pavlova. 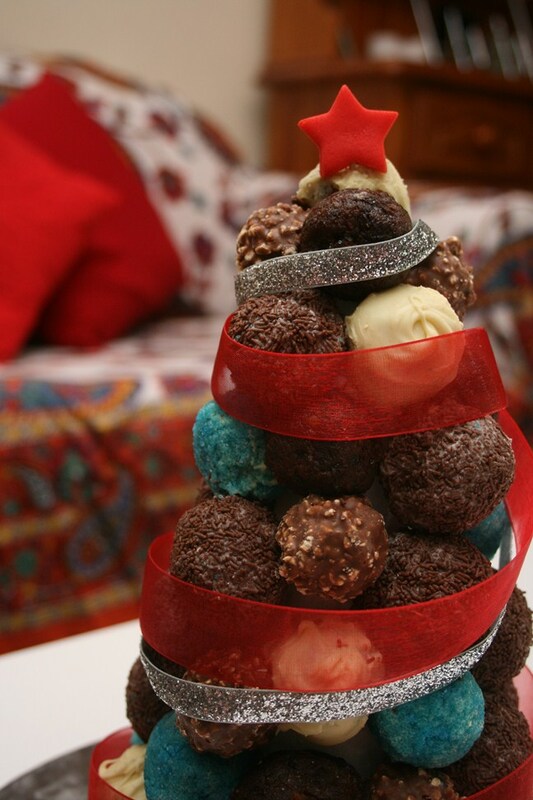 So looking through the interwebs the truffle-tree sounded like a great idea! And so I decided to make truffles with fruit cake (inspired by the cake bites/pop craze) but I didn’t add frosting – just brandy and it made the mixture pliable enough to roll into balls. I didn’t make my own cake, I bought a dark fruit cake to save time and normally I don’t do that, but the cakes around this time are actually quite delicious. Feel free to make your own cake though! 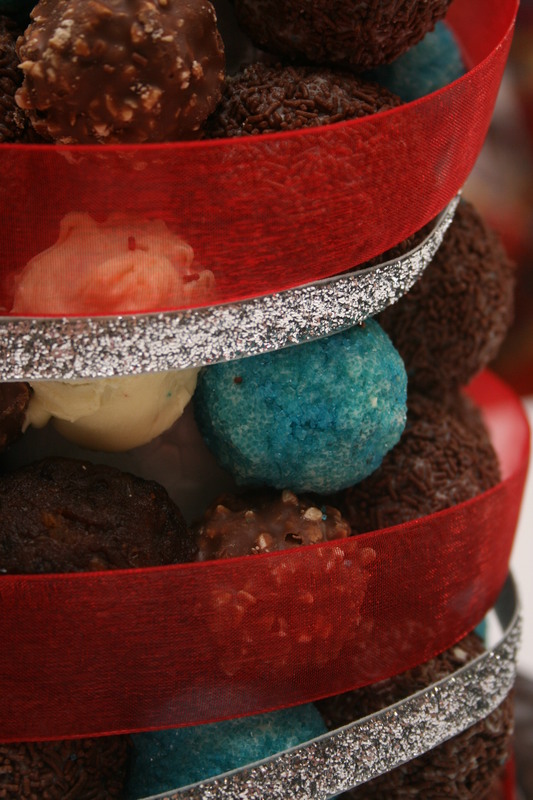 To make the christmas cake truffles – process the fruit cake into crumbs and slowly add 1/2 cup of brandy and mix well. The mixture should be nice and sticky. Put into the fridge to firm up for about 1/2 hour. Line a tray with baking paper and roll 1 tsp of mixture into a ball. This stage can get quite messy and you will need to wash your hands and start again at various points. It’s fun though! When you have finished rolling into balls, place in the fridge for about an hour so the balls firm up. Melt the white chocolate and fill some small bowls with sprinkles of your chosen colour, coconut that has been left white or tinted and any other decoration to coat your truffles with. I wanted to use white chocolate for mine but I ran out and didn’t realise so I stuck with chocolate sprinkles and blue sugar. Carefully coat the balls in the white chocolate then quickly roll them in your chosen coating or leave them plain. Take your cone and starting from the bottom, insert a toothpick on a 45 degree angle and attach your truffle to it. Working your way around the cone, keep adding in rows until the cone is covered. It is a good idea to have your cone resting on something, I used a 10″ silver cake board (just a thin one) that I spread with a bit of melted chocolate first then stuck the cone on that. I also used some Ferrero Rochers and left some truffles uncoated with chocolate for texture and colour; I love the look of all the different varieties. You could use all sorts of pre-bought chocolates for this project like Lindt balls, and it gives guests a non-alcoholic option too. When you have finished building your tree, decorate it with ribbon and I made a star from fondant that I inserted into the top with a toothpick.